Some time back, I received some art from 4of7, a regular visitor and commenter on IMAO. He is an artist, and has his own blog, Little Worlds, where you can view some of his art. Here’s another one of the pieces of art 4of7 shared, and that I’m please to now share with you. 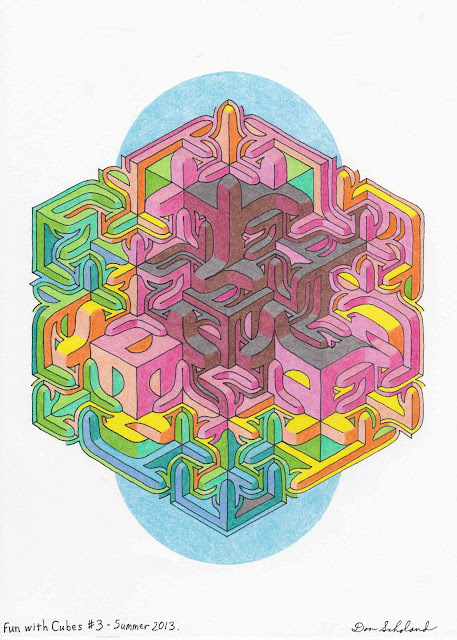 Fun With Cubes #3 – Summer 2013. Copyright © 2013 Don Scholand. Used with permission. I have more I’ll share in future posts. Three dimensional in two dimensions begun in one dimension (a pencil point). And in color! ALWAYS a treat. Amazing journeys that proceed with one line. I've been adding these to Little Worlds as updates to the posts where they were first mentioned; A Little Story and 2013 Fresh - July. It's good to see them again. I mean, I know I drew them, but I'd started to forget the details of them.